Based on a series of ​MLB dominoes that fell throughout the day on Monday, it seems like Harper to the Phils has gone from inevitability to reality. We've ​heard for weeks that Philadelphia was the favorite to land Harper and swipe him from within the division, but all those reports also came alongside rumblings that the man wasn't entirely excited to arrive in the city. It's possible things changed. It's possible that wasn't true. And it's possible money talks, because everything's pointing towards a deal being announced Tuesday. First came these Vegas missives, claiming the deal has been wrapped up, and all Harper bets will be taken off the board. Not necessarily trustworthy all by itself, but intriguing. Then, of course, the "Accidental Tweet/DM"​​ had to be involved. 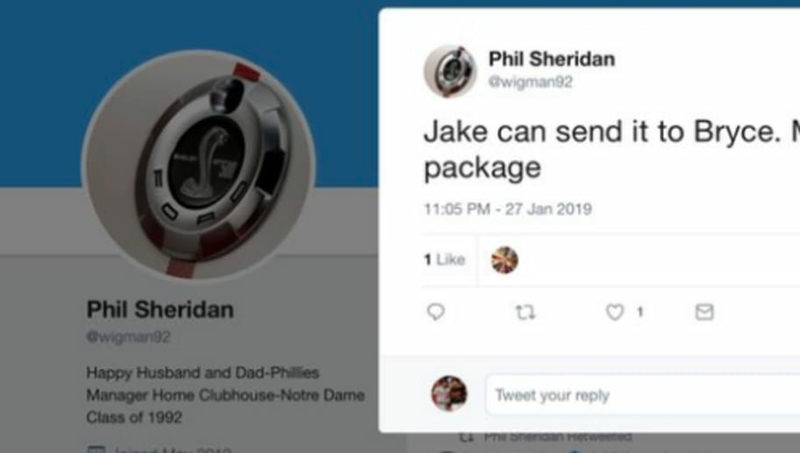 Check out Phillies clubhouse manager Phil Sheridan saying, "Jake can send it to Bryce," likely referring to fellow Scott Boras client and Phils pitcher Jake Arrieta. In fact, the deal's at the point where ESPN's got their graphics ready at the LA office. Something strange is afoot. The Phillies now have the same odds today to win the World Series as the Cubs. Vegas knows something...feels like a Harper announcement is looming. Maybe a surprise Machado move but Harper seems the most feasible. Of course, this is ALL capped off by MLB The Show's supposed "reveal" on Tuesday, about which they've been goading Phillies fans repeatedly.